Grab some great fresh ingredients, add a sprinkle of time and hey presto, you have dinner! 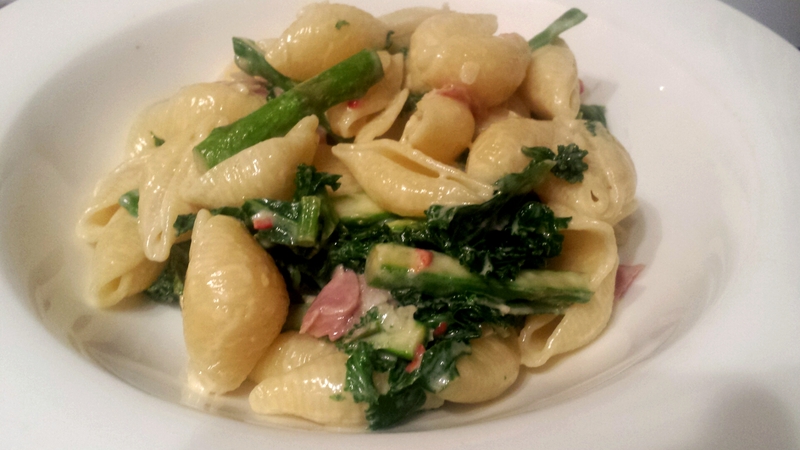 Use the best produce you can afford and your reward is a delicious savoury pasta that will please everyone. You can also use chicken instead of the ham if you prefer and it is just as tasty. 1. Start off by boiling a pan of water ready for the pasta and cook according to the packet instructions. When the pasta is 4 minutes from being ready, add the kale before draining well. Meanwhile get going with the sauce by grabbing a large frying pan, heating the oil over a medium heat and frying the shallot, garlic and chilli for one minute. Next up goes the sliced anchovy which will add a savoury hit. Stir well to ensure that the fillets break down. 2. Stir in the asparagus and ham to fry off so it begins to soften (or it is also delicious with a bit more crunch still if you prefer). Lower the temperature and add in the mascarpone and stir well to combine. Add the drained pasta and kale before giving a good squeeze of lemon juice and a grating of parmesan to finish. Serve immediately in warmed bowls and enjoy! This makes use of some of the best seasonal ingredients around at the moment and it is sure to be a crowd pleaser. Earthy, sweet and may make up the perfect combination! 1. Preheat the oven to 180c/ 160 fan. Get the lentils on the go by placing in a pan of cold water, bringing it to the boil for 10 minutes before lowering to a simmer for the next 20-25 minutes until the lentils are tender. When they are ready, drain and set aside. 2. For the roasted vegetables, place the beetroot and onion wedges in a roasting tray along with the whole garlic cloves (do not peel these). Add in the olive oil and vinegar and toss well to coat all the vegetable wedges. Roast for 45-60 minutes until the vegetables are tender when tested with a sharp knife. I checked the vegetables from time to time and turned them as needed to ensure even cooking. 3. Meanwhile cook the sausages until cooked through and golden on the outside. While they are cooking you can make the dressing by combining the mustard, oil and lemon juice. Remember to taste as you go and make any adjustments to suit your tastes. Take a large bowl and combine the lentils, vegetables and a splash of the dressing. You can either fish the garlic out of the roasting pan and discard or, do as I do, and squeeze the roasted garlic from the cloves and mix through with the lentils. Just before serving add in the watercress leaves. 4. 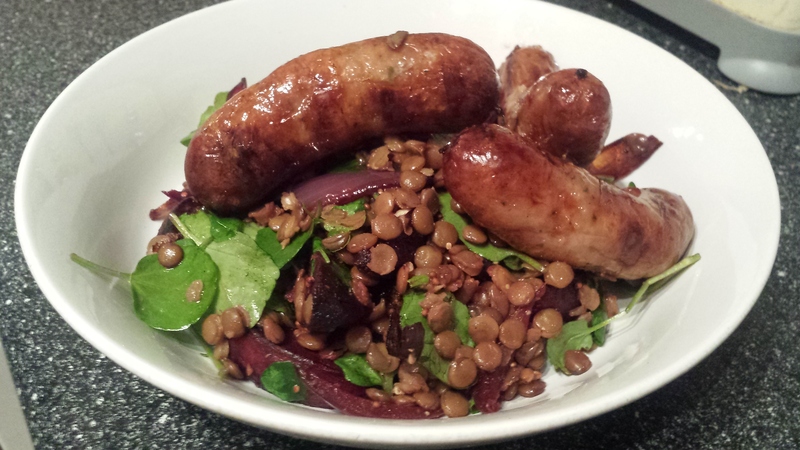 Serve in warmed bowls with the juicy sausages on top of a bed of lentils and finished with a good drizzle of the mustard dressing. Time for another pork cheek recipe I feel! 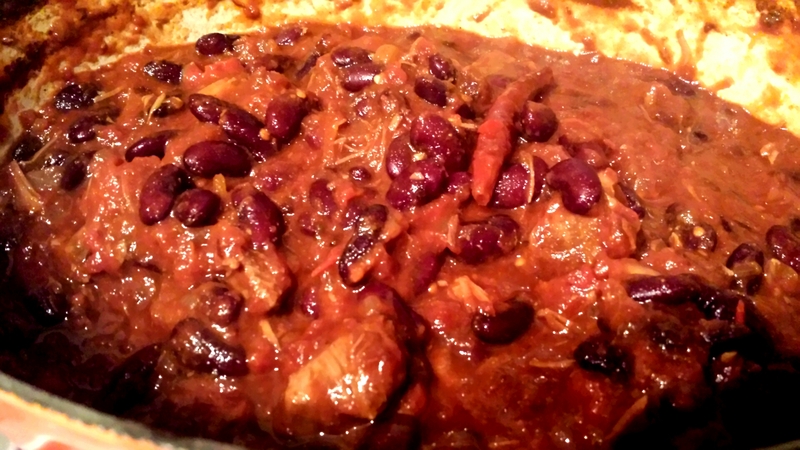 This time I have used it in a chilli which has a delicate balance between smoky and spicy flavours and the tender pork. Yet again, it’s all about low and slow cooking so don’t rush this! 1. Start by preheating the oven to 160c/ 140 fan. Take a glug of oil in a large heavy casserole pan and brown off the pork cheeks for a few minutes before setting aside. Next up, fry the onion and garlic together until softened and about to turn golden. 2. Combine the coriander, cumin, oregano, cayenne and paprika and add to the onions. Cook together for a couple of minutes before returning the pork to the pan and coating it in the spice mix. At the stage I prick the dried chillies and pop them in the pan too. The ancho chillies bring smokiness to the chilli alongside the paprika and the arbol give it a kick! Add the kidney beans, making sure they too are well coated, before the tomaotes and stock goes in. I tend to put half of the stock in at this stage and reserve the rest for during cooking if it needs a bit of extra moisture. In goes the treacle to add a great depth of flavour alongside the savoury chillies. 3. Bring the chilli to the boil on the hob before placing in the oven for 2 1/2- 3 hours until the cheeks are tender and the sauce is thick and unctuous. Check the pork every now and again as it cooks and add extra stock if needed. Finish with some roughly chopped coriander leaves, serve with rice and dig right in! A cheeky chilli fit for every table! Everyone is talking about kale. It clearly is the green leafy vegetable of choice for many and for many good reasons. Not only is it purported to have a whole host of health benefits but it is also delicious! Brighten up your dinner with a spiced vegetarian dish that can be served as either a main or a side dish. This curry is not designed to be swimming in sauce but it is just as flavoursome so give it a go. 1. Get going by heating the butter over a medium heat in a large frying pan. Add the onion until it starts to soften before cooking the garlic and chilli for a further minute with it. Next up goes the cumin, coriander and turmeric to cook for another minute. Stir in the tomato puree. 2. Into the pan goes the chickpeas and stir well so they are coated in the spice mix. Then add the kale and stock to the pan before covering and steaming the kale over a low/ medium heat for 10 minutes until wilted and tender. When it is ready, pop in the yogurt, remove from the heat and cover to keep warm. Just before serving add in the garam masala to lift the flavour even more. 3. I like to serve this with a crispy fried shallot and curry leaves which adds another dimension. To make this, take a small pan and add an inch of oil and warm until hot. Test a shallot ring to double check the oil is the right temperature- it should sizzle as soon as it hits the pan. Fry off the shallot and curry leaves in batches until the piece turn golden, remove with a slotted spoon and blot on kitchen towel. 4. Serve the curry into warmed, deep bowls and sprinkle the shallot and curry leaves over before taking it to the table. 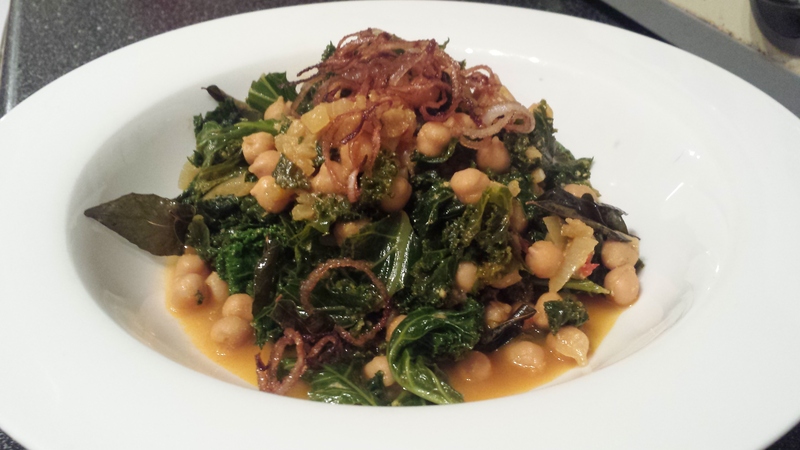 Spicy kale and chickpea curry- a moreish dish for a chilly evening! Now there’s no excuse not to grab some breakfast before a busy day with these simple breakfast bars. 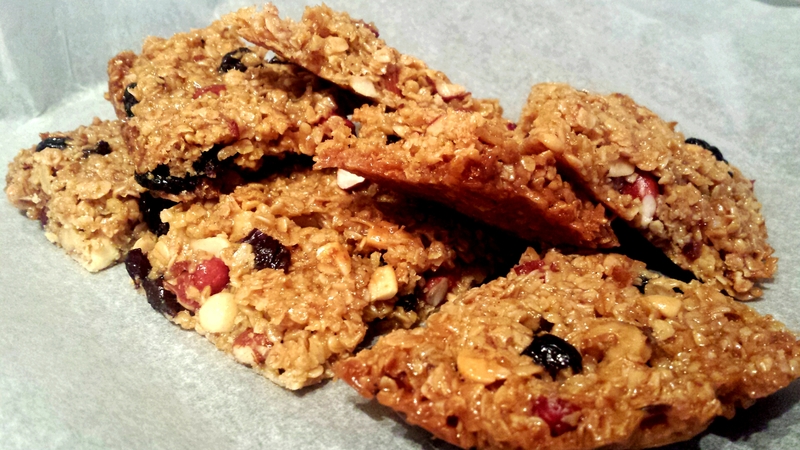 This recipe can be tweaked to your heart’s content so I have given you the basic recipe so play around with different combinations of dried fruit, nuts and seeds to find your perfect bar. It may not be the healthiest bar in the world but everyone needs a treat now and again! 1. Preheat the oven to 160c/ 140fan. Start by melting the butter, syrup and sugar in a pan over a gentle heat before folding in the rest of the ingredients. Combine well and place the mixture in a lightly greased or lined baking tin which is around 20cm in size. 2. Bake for half an hour before removing from the oven and allowing to cool. As the mix cools it will firm up and then it is ready to cut into bars. Store in an airtight container and they will keep for a week- not that they will last that long by the time your family tries them! Perk up your tastebuds with this flavoursome rice recipe. It uses a crunchy combination of vegetables as well as succulent prawns and pork which go well with Indonesian spice. Ketjap manis features in this recipe to give a further tang- this can now be found in supermarkets and is a thicker, spiced version of soya sauce. 1. Get a large wok and place a glug of vegetable or groundnut oil and heat. When the oil is hot, add in the chilli, shallot, garlic and ginger and cook for a minute. Next in goes the sugar snap pea slices and carrot for a further minute. 2. 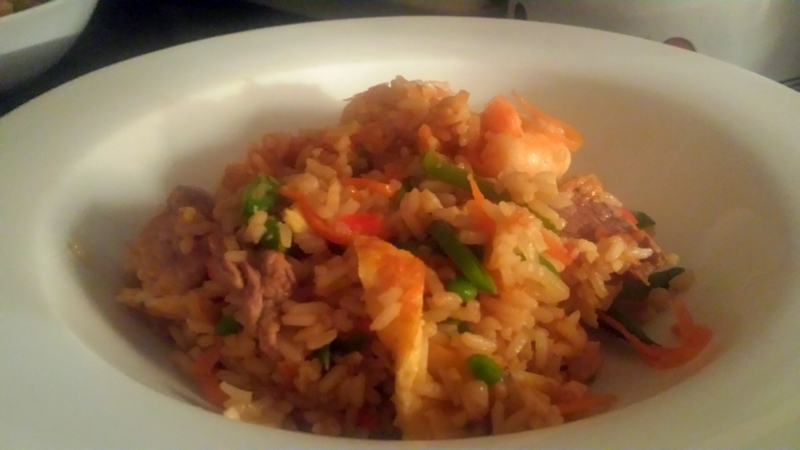 Pop in the pork and prawns for a two minutes before stirring the precooked rice in well to combine everything. Leave on the heat as you add the ketjap manis and keep it cooking. Taste as you go and adjust the amount of ketjap manis if needed. I also made a wafer thin omelette which I then thinly sliced and stirred through the rice. When the prawns and pork are cooked through finish with a final flourish of fresh coriander and serve. A tasty stir fried rice- perfect to brighten up a dull January day! 1. Preheat the oven to 200c/ 180fan. Heat the butter and flour together in a saucepan before adding the milk and cream little by little. Make sure no lumps form! Bring to the boil when all the milk is combined before lowering a gently simmer to thicken the sauce. 2. Meanwhile, par boil the sprouts and set aside. Take a small pan and gently fry off the shallot until softened and turning golden. You can also either use the same pan to crisp up small pieces of the ham or you can add this uncooked later on so it’s up to you. I used Carmarthen ham which worked perfectly. 3. The sauce should now be ready to season and to stir most of the parmesan into. Reserve some to combine with the breadcrumbs (I used panko) for the topping if you like. Add the sprouts, ham and shallot to the cheese sauce before placing in an ovenproof dish to bake for 30 minutes or until golden and bubbling. Serve as the main event or with a meat dish. It also goes well with a good piece of steak! 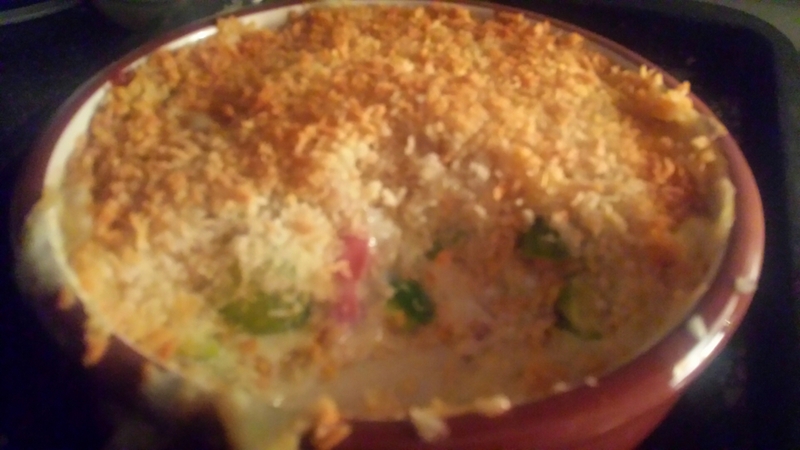 An indulgent gratin perfect to use the last of the Christmas sprouts!